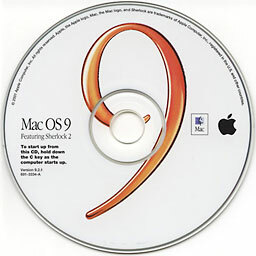 The final release of Mac OS 9 occurred ten years ago, in 2001. Mac OS X was launched that same year, and Steve Jobs symbolically buried his old nemesis in 2002. The old Mac OS survived for another few years, running on dual-booting G4s or as Classic Mode under OS X, until the release of the Intel Macs and later OS X 10.5 Leopard, neither of which support Classic Mode. Apple is a very forward thinking company, but sometimes you can’t escape your past. Some operating system releases have a way of surviving long past their expiry dates – Windows XP, anyone? Based on recent personal experience, it’s safe to say that Mac OS 9 isn’t dead yet! A couple of months ago I wrote about Installing Mac OS 9 on the Mirrored Drive Doors Power Mac G4. A client needed the older OS to run a pre-OS X version of Digidesign Pro Tools, and that Mac model requires a system-specific (non-retail) install of Mac OS 9.2.2. Obtaining and reinstalling this older software proved an interesting experience, so I posted the info online for other vintage Mac nerds. Turns out that column has had surprising popularity, both on Low End Mac (LEM) and my Vintage Mac Museum Blog. Many more hits than usual, and I’ve been directly contacted by about a dozen people since that posting looking for copies of OS 9 to install on their old Macs. Dan Knight at LEM has been contacted as well. Like my first client, a few folks are also running Pro Tools or other old DAW applications and looking to get things setup on a fast single- or dual-processor G4 tower. Professional audio software is not cheap, and many users have a slew of third party plugins in addition to the primary application. When OS X came along, many systems weren’t upgraded due to the total expense involved, which means a lot of working -but now incompatible -hardware and software is still out in the field. Another client who contacted me works for a national medical diagnostic company. They are using some lab equipment that has control software that only runs in Mac OS 9. A few Quicksilver G4 towers had been procured for installation, but their IT manager couldn’t get a stable OS 9 system running on the machine. He needed to get a working setup going to replicate throughout their facilities. Like the MDD, the Quicksilver was produced after the last retail OS 9 CD was released, and some later models require a system-specific installation. As with the MDD, this was only available on the bundled Software Restore CDs. I don’t have a set of Quicksilver Restore CDs, but I suspected that the liberated version of 9.2.2 from the MDD’s Restore Disc would work on that model. My client agreed to give it a try. Verdict: Yes, it works fine. Sweet! A few days later, I (fortuitously) inherited a Quicksilver myself and confirmed again that this does work. However, on my particular model I needed to disable the ATI Video Accelerator extension to fix a hang at the desktop after bootup. Ah yes, incompatible System Extensions, don’t we all have warm fuzzy memories of those (not). What surprises me is how many people are still using a ten-year-old operating system for productive tasks. A not-insubstantial set of folks still need (or want) to run OS 9 for reasons both business and personal. We know that Macs themselves are well-built machines that stand the test of time; it appears Mac OS versions do so as well. Be sure to partition your drive as APM and install Mac OS 9 drivers. One technical note for those trying to recreate an OS 9 system themselves: Be sure to partition your boot disk using Apple Partition Map (APM) format with Mac OS 9 drivers. Drives formatted under Mac OS X 10.5 and higher will not contain these drivers and will be invisible to the Classic Mac OS. You need to format the drive with Drive Setup in Mac OS 9 or use Disk Utility in Mac OS X 10.1 through 10.4.11 Tiger and check the option to Install Mac OS 9 Drivers. Viva la Mac OS 9!